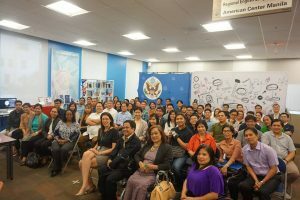 Photo shows the Prof. Ayanna Howard of the School of Inter-Active Computing in the College of Computing at the Georgia Institute of Technology, with some officials of the American Center Manila/US Embassy, NCDA, students, professionals, teachers, researchers, DPOs and leaders with disabilities during the Forum on Human Centered Robotics held at the American Center Manila. 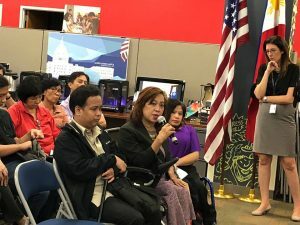 The National Council on Disability Affairs participated in fora featuring human-centered robotics and technology. 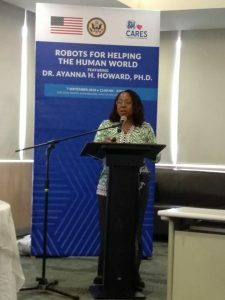 Hosted by the American Center Manila and SM Cares, the Fora entitled “Forum on Human Centered Robotics” and “Robots for Helping the Human World” were held at the US Embassy in the Philippines and SM Mall of Asia on September 6 and 7, 2018, respectively Both fora have Prof. Ayanna Howard of the School of Inter-Active Computing in the College of Computing at the Georgia Institute of Technology as the Keynote Speaker. The events which were participated by students, professionals, teachers, researchers, disabled people’s organizations and leaders with disabilities, provided venues to discuss how technology can increase the quality of lives of persons with disabilities and facilitated the exchange of ideas about ways to promote technological innovations that can improve accessibility and inclusiveness for persons with disabilities and other similar needs. In her talk, Prof. Howard discussed how working with people results to developing robots and gamefield technologies to support the special needs of children with disabilities. She also talked on science-driven robotics, robot-assisted therapy system and tablet-based therapy games, among others. 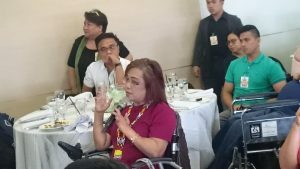 She also reported that a list of applications for different types of disabilities could be availed of at the google play. Relevantly, the SM Management committed to support the undertaking by making the technology available in SM malls once it is fully developed.